« FujiFilm FinePix F300EXR – don’t delay that upgrade! You can see more data about the part in the HP5082-7432/7433 7-segment LED Display Datasheet but some of the most important data is the current needed to light a segment – given the right ambient light, you can see the output at 250μA . It’s therefore not a surprize that these little displays were used in watches and battery-powered calculators back in their heyday. 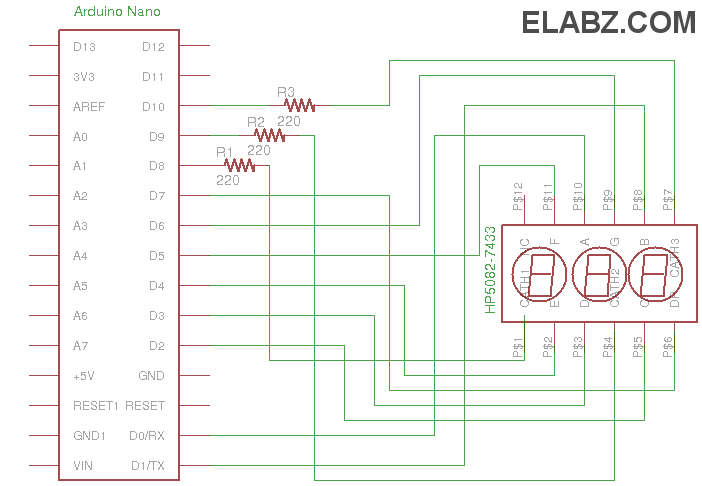 It means that the highest load digit – “8” – will only draw 3.25mA and you can both source and sink enough current from Arduino Nano’s digital output without overloading the Arduino. One of the important features of this circuit was going to be its simplicity and therefore some sacrifices were made. For example, you would normally have 8 current limiting resistors, one for each segment anode. That would make each segment’s current equal to that of the next which, in turn, will make all digits equally bright. In this case I only used 3 resistors – one for each common cathode. All anodes comprising one digit therefore share one limiting resistor and so the digit “8” that has 7 segments is less bright than digit “1” that has only two. Also, the 220Ω limiting resistor is only working properly with digits having 5,6 or 7 segments. The rest of the digits are having their segments lit with currents higher than needed. So, you’re welcome to improve this circuit by eliminating the 220Ω current limiting resistors in the common cathode lines and use 8 (7 if the digital point is not used) 510Ω + in the anode lines instead. 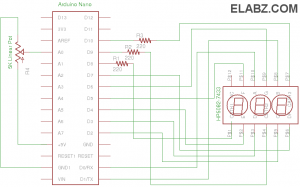 One other characteristic of this circuit is the large number of Arduio’s output lines used. 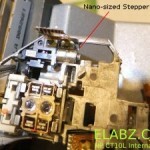 Nano has 14 digital outputs. From those we are using 8 for the anodes (even though the digital point is not used in the software I include here – another improvement direction) and 3 for the cathodes. So, there are 3 digital outputs left for either activating other types of outputs or making a 6-digits display by adding the second HP5082-7433 if all the rest of Arduino connections in this project are inputs. So, to finish with the hardware part of the project, here is how the breadboard looks like (left). It’s a pretty simple circuit that can be thrown together in 5 minutes or less. Now to the software part. There are two different sketches attached here – one is for the simplest circuit that has no inputs whatsoever and only counts from 0 to 999 (in a loop). The other one is for the circuit with a 5KΩ linear potentiometer which has its wiper (middle contact) connected to Arduino’s Analog Input 0 and its other contacts to ground and +5V respectively. I’ve seen several implementations of seven segment output using Arduino and many are using delay() function to light the current digit long enough for the eye to register before moving to the next. 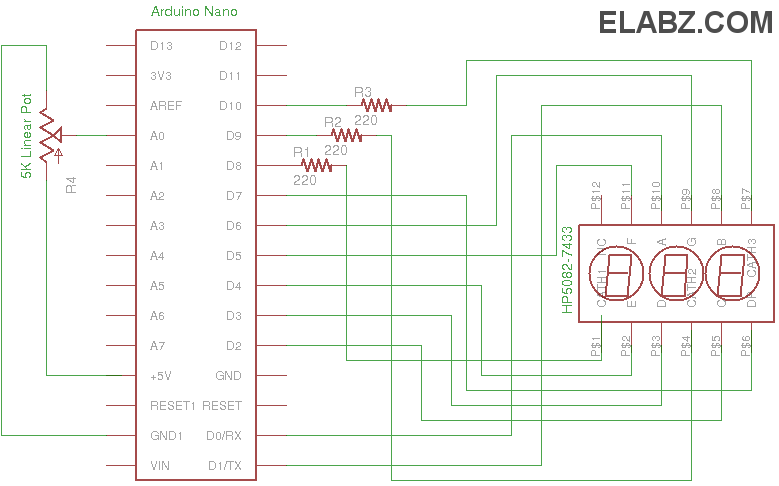 I think it’s pretty unfortunate because during that time Arduino cannot do anything else – cannot scan buttons or read analog values because it’s essentially paused. In my code I made sure that the scanning functionality does not actually lock the processor up for the duration of the cycle. It’s then free to service all the other functional elements of your project. 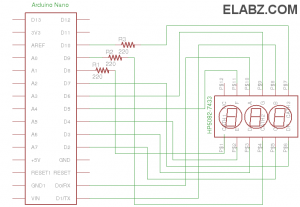 Thanks for stopping by my blog and offering your suggestion (with link to here) on avoiding the use of delays when working with multi-digit 7-segment displays. The vintage display is certainly cool. I got a couple in a grab bag I bought from Jameco. Good stuff. Hey, your WP syntax highlight plugin looks awesome! Hi and thank you for sharing! 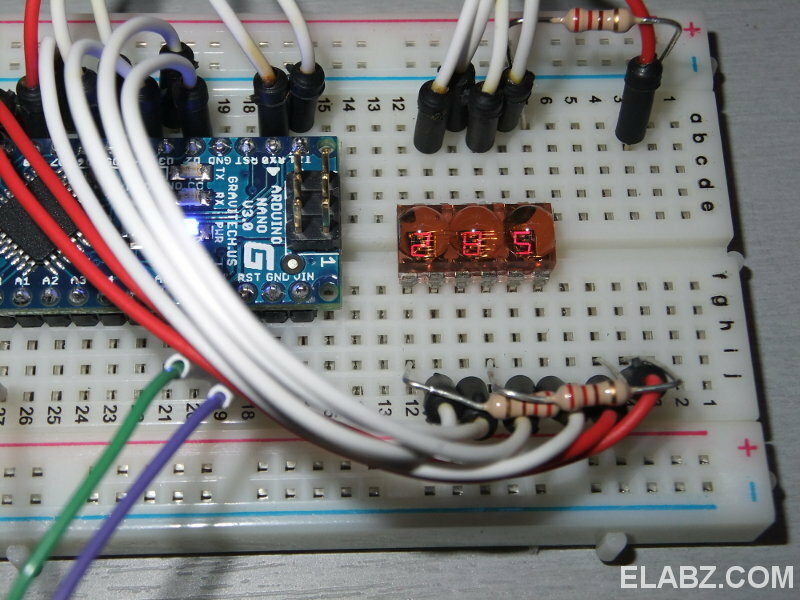 I’ve seen in many schems of arduino driving a 3(or more) 7 segment display and the majority, if not all, included mosfet diver to the display. So why yours don’t have?